Here is another free book from Eddie Climo. This is number 2 in the Beatrix Potter series and is entitled “Drolla Gwywer Knofennyk / The Tale of Squirrel Nutkin” Enjoy! 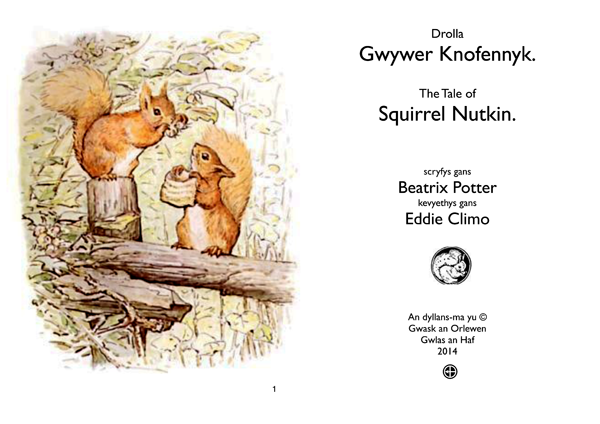 You can download ’Drolla Gwywer Knoffenyk’/ ‘The Tale of Squirrel Nutkin’ for free here. If you don’t have Adobe Acrobat on your computer, you can download a free copy here. Revisit the Agan Tavas website soon for more delightful books in Cornish.